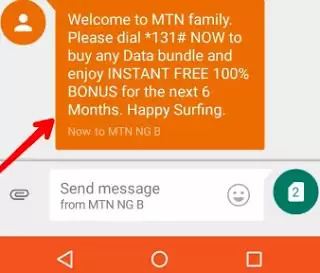 MTN Family is an offer from MTN that gives you 100% bonus on any data you purchased. You will be enjoying this offer for complete six month. It’s a very good opportunity for any MTN user to get more data value with the same amount of money although it’s not meant for everyone but i will show you how you will enjoy it even if you are not eligible for it. The IMEI we are tweaking is a Tecno Phantom 5 IMEI and MTN is giving users of the device surprising “100% Bonus On Any Data Plan they purchase” which after successful activation, will run till the next six months. Assuming you buy 1.5gb data for N1000, with this offer, you will now be given 3gb for the same price valid for a month. The same thing applies when you purchase the3.5gb data at N2000, you will be given 7gband this continues till six months so you getdouble data bonus as benefit. What If I Didn’t Receive The Message? After receiving the SMS from MTN, next step is to migrate to MTN beta talk by dialing *123*2*6#. You are all set. From henceforth, once you purchase any data from MTN, you will be given another data worth the same value of what you purchased. You can check all MTN available data plans and bundles by dialing *131# and enjoy 100% bonus. I know some people are still new to the tweaking world while some are already wizards in it so am addressing this to the guys and ladies that are new to it. I have already provided step by step guide on how to tweak IMEI both on MTK devices and non MTK devices. If you are still confused or skeptical about the whole thing, don’t worry; you can select from any of the below Tecno phantom 5 IMEI which i have already generated for this tweak.